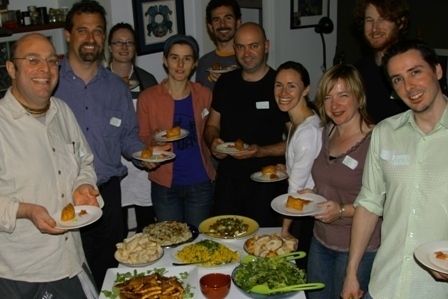 ‘Vegan cooking’ was the theme of last night’s culinary event at the lovely inner-city apartment of our cordial hosts Jo and Stephen, in Melbourne’s Fitzroy. As it happens, almost all of the vegans, God bless’em, decided not to show up. So we enjoyed the feast without them. So there. 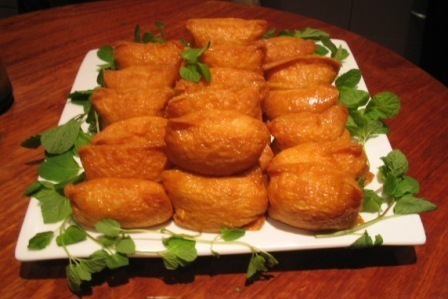 The famous Japanese fingerfood Inari-zushi, pictured above, never fails to elicit delight. Tofu steaks on a bed of saffron couscous were the highlight for many. That’s the organic tofu sliced and ready to fry. And my new Furi knife, sharp like a razor. I describe our plan of attack with Anthony. And our the sole vegan for the night, the quiet but coolly efficient John, observes on the right. Another succesful evening completed, this very tired Kurma Dasa crawled to bed at midnight for the third time in four nights. Less rest for the slightly wicked.